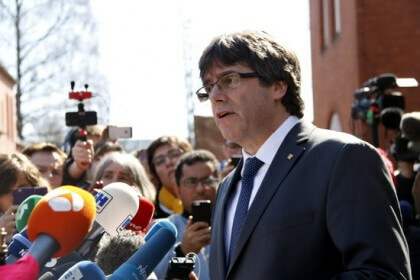 A German court ended extradition proceedings against the former Catalan President, Carles Puigdemont, on Friday, after Spain had withdrawn the European Arrest Warrant. Puigdemont is now free to leave Germany. The court in Schleswig-Holstein revoked a German warrant that had put Puigdemont in pre-extradition detention following his arrest in March. He had been allowed free on bail, reporting regularly to German police and had not been allowed to leave the country without the prosecutors’ permission. The Spanish Supreme Court judge, Pablo Llarena, had dropped extradition requests for Puigdemont on Thursday, as well as for five others wanted on rebellion charges for their push for Catalan independence. The decision had come after the Schleswig court ruled Puigdemont could not be sent back to Spain on rebellion charges, only for the lesser charge for misuse of public funds. Puigdemont is believed to be living in Hamburg, yet is expected to return to Belgium.